DESCRIPTION: High/low temperature (-75 to +500F), high strength (350psi), quick curing (24 hours), non-flammable high solids sealant. Insulates electrically (550V/mil) and thermally. All-weather proof. Superb adhesion to materials including silicone rubber. SB-188 cures flexible to allow movement of dissimilar materials. 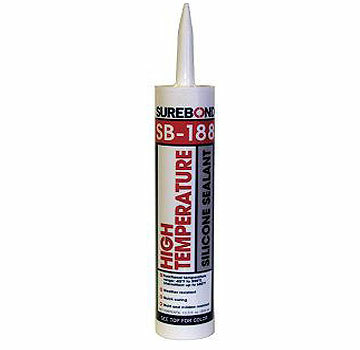 USES: SB-188 is recommended for use with silicone flashing boots, metal roofs in extreme environments, marine, HVAC, construction, architectural, electrical, automotive, racing. Not recommended for use with Copper. OPTIONS & COLORS: Standard in Clear and Black. Custom color available with 110+ gallon orders by special request. INSTALLATION : Interface and surfaces must be clean, dry and free of dust, dirt, oil and and release agents. Cut cartridge nozzle at slant to 1/4" hole and puncture inner seal, apply bead size as desired. Apply uniform bead with steady pressure. Tool immediately after application to ensure full contact with both sides of the joint area. Sealant starts to skin over in 20-25 minutes. See data sheet for further details and limitations.